In honor of Halloween I peeled and chopped a small pie pumpkin today to freeze to maybe make a pie or cheesecake at Christmas. I found a recipe at Chatelaine.com for a roasted pumpkin soup, and I decided to try it. We had it for dinner and it was delicious! I have pasted the name and ingredients below. It was really very easy. After that I didn't do much other than rest, and a little hand sewing. I will try to post a picture of a postcard that I am hoping to finish tomorrow. I also painted a piece of fabric and put it outside in hopes of getting some sun prints. I had hoped for a little more sun, so the results were not great. Preheat oven to 375F (190C). Line a baking sheet with foil. 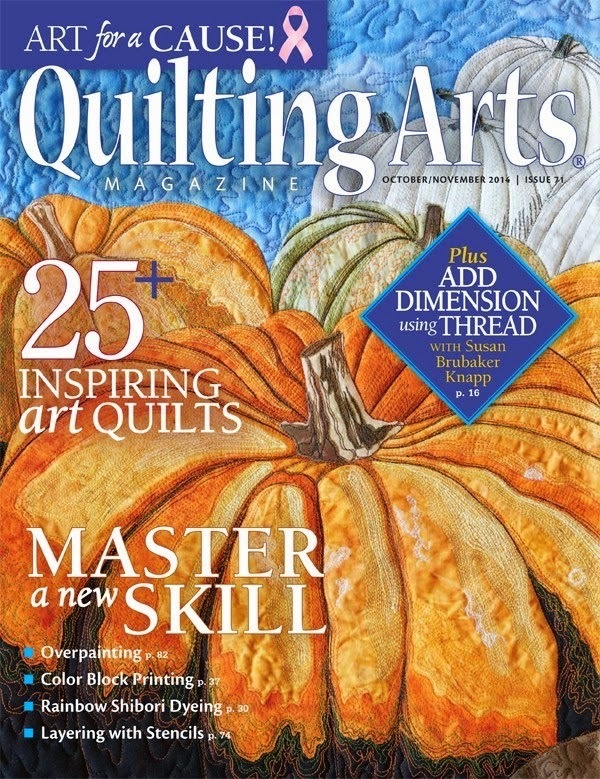 Cut pumpkin into quarters or squash into halves. (Microwaving on high for 2 minutes makes this easier.) Scoop out and discard seeds. Score flesh with a knife, making deep criss-cross slashes. Place flesh-side up on baking sheet. Brush with about 1 teaspoon (5 mL) oil. Peel and cut onion into quarters and toss in a bowl with garlic and 1 teaspoon (5 mL) oil. Add to baking sheet, placing onion cut-side down. Evenly sprinkle pumpkin and onion with nutmeg, salt and pepper. Roast, uncovered, in centre of 375F (190C) oven until pumpkin is very tender, from 45 to 60 minutes. If onion or garlic begins to burn before pumpkin is cooked, fold foil overtop of them. Remove pan from oven. Cool until they can be handled. Meanwhile, peel and core apple, then cut into bite-size pieces. Heat remaining teaspoon (5 mL) oil in a large saucepan set over medium- high heat. Add apple and ginger. Sprinkle with curry powder and stir constantly to develop curry flavour, from 2 to 3 minutes. Stir in broth and water. Scoop out cooked pumpkin from skin and add to soup along with onion. Squeeze out roasted garlic from it papery skins directly into soup. Bring to a boil, reduce heat to medium and simmer, uncovered, for about 10 minutes to develop flavour. Meanwhile, using an electric mixer set on high, whip cream with maple syrup in a small deep bowl until soft peaks form when beaters are lifted. Fold in thyme. If not serving immediately, place in a covered container and refrigerate up to 1 day. In a food processor fitted with a metal blade, purée soup in batches. For a smoother consistency, press through a strainer. Serve in soup bowls with a dollop of maple-thyme cream in centre. Soup will keep well in the refrigerator for at least 3 days and in the freezer for about 2 months. I can't believe it. I've barely had a few colds in the last 120 years, and this fall I've had two already. My students are always sick, but since I started the flu shots, I usually don't catch anything. This is all the round-about way of to tell you that I'd like to be posting something interesting here; however I just couldn't drag myself away form a sniffling stupor on the sofa to do anything. I'm hoping to be back with something before the weekend's over. wish me luck. My husband and I went to yoga to-night and had a late dinner, so I haven't spent a lot of time in my sewing room to-night. 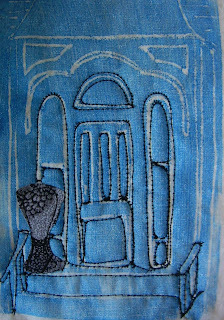 I did pick up my beading needle and thread and started putting some beads onto the little postcard size doorway that I started a couple of weeks ago. I'm wondering what you think. I don't love it, but I have decided to finish it because I had an experience last summer when I decided to see what I could do with a reject. I started out really not liking a piece, but I persevered to the end and it ended up being one of my favorites. It won third place in a show. Sometimes I think it's a good learning experience to just keep going and see where it leads. The picture I can see is a touch out of focus, but it's jammy time for me, and I think you can get the idea. What do you think? . It's been a lovely week end, but not so much for sewing. Sometimes I just have to set priorities, and fresh air and exercise are my first priorities. I usually try to have my camera or my sketchbook with me though so I can get a little creative time in. Yesterday we were invited to a friend's camp for dinner , and even though it was cold and wet, we went for a walk, and then had dinner by the wood stove. Who could ask for better? The picture below is one I took on the road into the camp. It was our first snow. The next picture is of a very quick sort of sketch that I did to try some sample colors for when I start to print my tree designs onto my fabric. I like the colors, but I want to try some with whites or grays as well. I'm aiming for the colors you see in the woods this time of year, and also the colors on the chickadee - black, beige and gray. In the woods where there are still some leaves clinging to the trees, so you get some patches golds and mossy greens against the grays and browns. These are my favorite color combination's right now! I did the sketch by rubbing a brown oil pastel over a tree relief and then adding watercolor and black china marker. 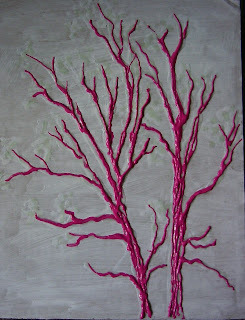 The final photo is of the tree relief that I just redid. It is pink because I tried it twice with white school glue and it kept going too flat, so I finally pulled some old dimensional paint out and used that. I can't wait until it's dry enough to work with. I've not done much this week, due to just getting back int e groove after being out last week, and also because I had a couple of appointments after work. In fact to-night I have to head out shortly for my flu shot. 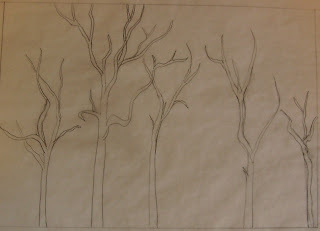 I did manage to get the binding cut for my cardinal wall hanging, and I have been doodling and sketching trees. 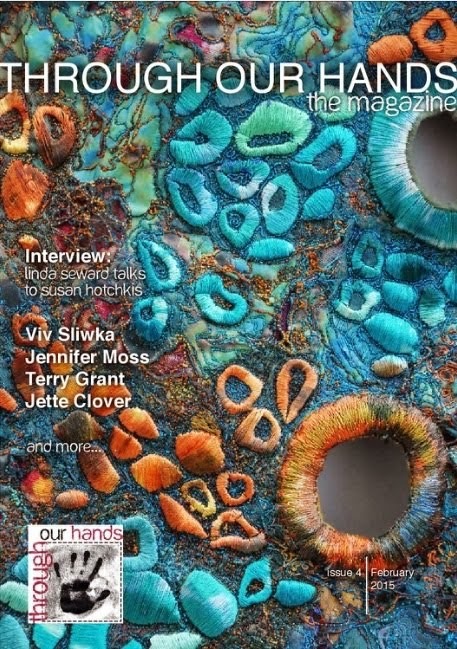 If you squint and look very carefully at the picture you might be able to see a rubbing plate that I am working on following the directions from Linda Colsh in the June/July issue of Quilting Arts. I used the blue school glue on cardboard as directed, but it settled in too flat, so I am now going to retry with the Lepages white glue. 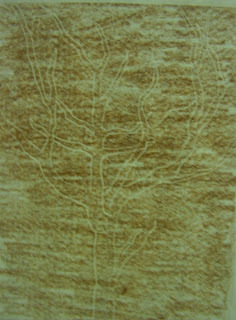 Once dry I want to try Linda's method of rubbing with the Neo Color II crayons and then silkscreening with acrylic medium. I haven't touched my sewing machine since the weekend; it is hard sometimes to get anything done after working all day. To-night my husband and I went to yoga and had a later dinner. I won't be sewing, so I thought I'd give a bit more of a review on one of the books I mentioned a few weeks ago, as I have now read most of it. It is called Journal Spilling by Diana Trout. It would be perhaps, a pretty basic book for anyone who is already creatively journaling, but I really enjoyed it. The journal beside it one I did while watching TV. I do writing journals most days with my adult students, so I have a little experience with the 'free writing' process. I noted one of the author's references was a book that I also read by Nathalie Goldberg called Writing Down the Bones which is a great book too for ideas on how to get started with journal writing. In Journal Spilling there are lots of basic methods for coloring and texturing paper and lots of ideas and prompts to spark ideas. I especially liked the section on the inner critic. It really resonated with me. the book just inspires me to keep doodling and journaling and wotking towards developing artistically and with my own style. some would say I have a style, I'm just not sure of it yet. 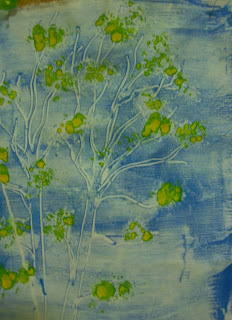 This is what I have been doing with a couple of my stamped prints. My idea is to make then Christmasy with pine boughs and lights. I really like the black gestural outlining, but I am undecided yet on the addition of greenery with the needle lace. Since I'm not sure, I think I will let it rest for a bit so I can think on it. Here is a second one that I didn't start to outline yet. 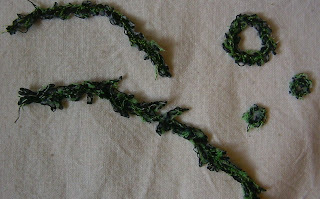 Here is some of the needlelace I want to add as greenery. There is a little tree for the urn. The little wreaths are only a couple of centimeters in size. I should have laid them next to a ruler so you would get a better idea of the size.The larger wreath is about 1/2 to 3/4 of an inch in diameter. Also, I am trying out contacts for the first time; well really it's the third try today to where them, and I have to go this afternoon to see the optometrist. I keep having a problem putting in the left one. I finally got it in, but I think it's inside out and now I cannot get it out. Of course I now have one blurry eye. I'm just giving it a rest and writing this with one eye shut before I go try again. I have to keep telling myself it's all about the process, not the product. I am experimenting and learning, but I keep hitting roadblocks when I can't find a tool or medium locally. I've always been 'all about' making do and being creative with what you have but sometimes you just hit roadblocks. There are some techniques I've been wanting to try, and I did some shopping while I was away- the only place we have here is Walmart, and after they moved in and put other places out of business, they then cut back on their fabric and craft department, so now we have nothing here. I started a linocut which I would like to use to print on fabric, but soon discovered that I didn't have all the right size blades. I want to use it with a silkscreen, but I can't find the right tape at the moment to seal the frame before I start. That's just a couple of things. As a result, today I resorted to the old basic but easy method of pressing my design into a foam sheet and printing from that. 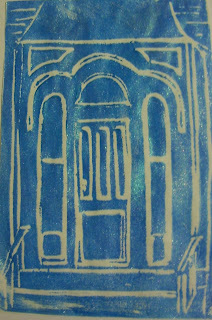 I would like to do more doorways...here you can see the first one I experimented with-- it's printed on paper. The next photo is of a mono print that I tried by laying paint onto Plexiglas with a brayer and drawing into it with a skewer. This was definitely an example of how not to do it. Let's see... the paint is too light, the leaves turned out as blobs, and I think a fold showed up in the print too, even though I did iron the fabric first. But... did I have fun? Yes, it's like being a kid again playing with the paints, and I want to try again; next time I will do the print with just the blue, and add the leaves to the fabric later after it dries. As you will come to see, I have a fascination with trees. It seems that a lot of artists do; it almost seems cliche, but I just can't help it. There are just so many variations in size, texture and color it is hard not to be entranced, and I seem to be attracted to silhouettes and lines, and of course that is exactly what trees are design wise. 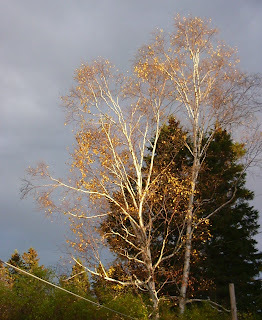 The following is a picture of the birch tree in my back yard. I have spent a lot of my time admiring this tree through all the seasons. On a hot summer's day I have listened to the leaves rustling in the breeze and stared at it for many hours while lolling on the swing on my deck, but it was particularly spellbinding in the sunlight to-night with it's few golden leaves lit up against the backdrop of the gray clouds. I had hoped to get a little more done this weekend, but then that's life isn't it? It just happens sometimes. I ended up with a minor but very painful medical condition towards the end of my conference and yesterdayI had to make a visit to the local ER for a small surgery. For anyone who has ever suffered with thrombosed hemorrhoids you'll know of what I write. I've been trying to keep my mind off the pain by keeping busy in between sitz baths and ice packs. So, I did start to carve my lino cut of an interesting tree shape that I have seen while traveling up a local ski hill on the chair lift. It is my first time working with this; in the past I have done some carving with the rubber blocks which I can now say are much easier. I think once I catch on to it, it will get better. All I did so far was to outline the shape, and I must go back in and make it deeper and then decide how much more to carve out. I was anxious though to see how it would look so I did a crayon rubbing on paper. I think you can just barely see the lines in the picture. It was an unproductive week as far as concrete artistic accomplishments go, but I had a great week nonetheless. I was home for a day after visiting my daughter, and then I was away at a work related conference. I had a good time and learned some things too. I always come home inspired, so they are worth the effort. I didn't even take my sketchbook with me as I knew it would be a busy schedule. The drive down was gorgeous though with the fall colors, and I spent time observing and imagining what I might create with the views (trying to stay on the road of course). If I had even 1 picture for every hundred I composed in my head, I'd be a prolific artist. Oh well, it's fun to dream and imagine. Tuesday, the day I left was my birthday, so I'd like to share some of my gifts with you. My husband really surprised me this year with a painting. It is from an 'emerging' New Brunswick artist named Cynthia Decoste whose paintings I admire. She had a recent show and I had picked out a couple that I liked in hopes of maybe getting one for Christmas. It really is quite an extravagant gift for us. I do love it! 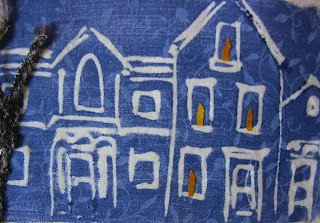 The very first photo in this post is of a pillow cover that my friend Anne did in Sashiko style. It is in my favorite color, and I think you can see the dragonflies on it. Isn't it beautiful? While In Fredericton I purchased a screen printing kit, and finally today I got it out and read the directions and started to think about what I might like to do with it. 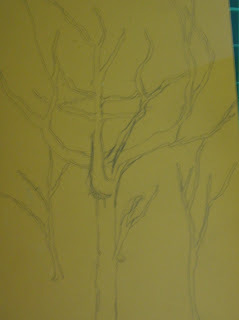 I did a drawing of some winter trees on tracing paper so that I can transfer it to a freezer paper resist, and I also drew a tree on linocut material to carve. My final pictures are of some seasonal changes I am making in the house. I purchased a curtain panel to try in my dining area for the winter. It is the one on the left. The gold colored ones on the right are sheer, and I thought I'd like something a little more opaque for the winter. I think I'd like to add some bright buttons or trim of some sort, and I plan to change the wall color to a chocolate brown. The color is a little off in the photo-- it is actually more of a burgundy. The final photo is of my bed where I put my winter duvet and changed the quilt. I had made this quilt for my tent trailer, and now that camping is over I thought I'd live with it on my bed for a while. Today is the day of the 2009 Studio Tour. I am leaving in a few minutes for the weekend to visit with my daughter who is going to university in Fredericton, so I'm doing a quick version. as you can see I followed directions and I didn't even take the time to clean up! I work in a combination sewing/computer/sitting room. I like having the little love seat by my window, so that I can sit with my hand sewing and watch the trees and the birds. That is where the idea for the name for my blog came from. It is a very small room--something like 9x10 with a nook for the computer. I have a drafting table and desk in another room where I can do some messier stuff with paints and such. The little sofa even has a hide-a-bed in it for when all my children are home. I managed to put the finishing touches on two of the small projects that were on my design wall, mostly because I've been home from work for the last couple days with a cold. I'm going tomorrow as I am feeling better. I just needed a couple of days on a double dose of my daily meds. Perhaps there is someone out there with the same thing -- I have an adrenal insufficiency --in other words my adrenal glands don't produce the hormone cortisone as they should and I must take it by mouth. It is not the greatest drug to have to take long term so it is always a juggling act. I finished the little snowman wall hanging except for the string of Christmas lights that he is supposed to be holding. I do have some; they are packed away in the Christmas boxes somewhere. 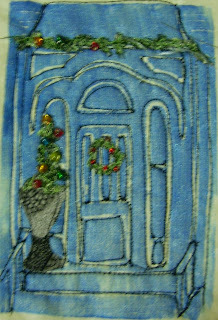 The second photo is of the small hanging I did using a piece of fabric cut from a flour paste resist. I described the method in an earlier entry. I rather like the colors. It measures about 9 1/2 by 16 inches.